The African Vision of EENI Business School & HA University is to be a reference in Africa in research and higher education in African and international business with ethical principles, so that our alumni, students and EENI Business School & HA University itself collaborate in the development of an Ahimsa (non-violence) Economic Area, based on the principle of non-violence in business. 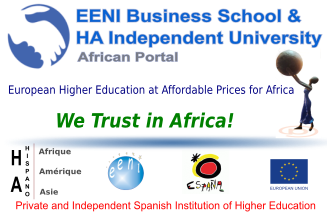 EENI Business School & HA University wishes to be the leader in higher education in international business education in Africa, Asia and Latin America. EENI Business School & HA University wishes to collaborate, through education, with the socio-economic development of Africa. “We cannot be locally (in a country) the best in everything, but become the best in the world in eLearning higher education in African and International Business”. Principle of harmony (respect) of religions.